Raul Albiol has admitted that the title may be out of Real Madrid’s reach but stressed that better La Liga performances will give his side a platform to challenge for this season’s cup competitions. Los Blancos dropped a further two points after being held to a 0-0 draw by Osasuna on Saturday, with Kaka dismissed for two yellow cards, and the former Valencia man says improvement is essential. 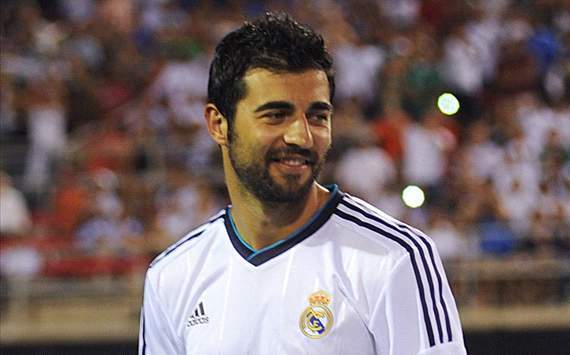 “We are not having a great time in La Liga,” the 27-year-old was quoted as saying by the club’s official website. “But we have to improve and we need to go into the knock-out matches in the cup and the Champions League as well as we can. “We know that the group of players are the same as last year and we hope to reach that level as soon as possible. A Champions League tie is special. Los Blancos are currently third, 15 points behind Barcelona, but Albiol has rejected any suggestion that there are issues in the dressing room that underpin their indifferent form. “We are not lacking motivation,” he added. “We get it just because we play for Real Madrid and we are have to go out to win wherever we are playing”. Real Madrid currently have 37 points from 19 fixtures, four behind second-placed Atletico Madrid.